When I found this recipe, I knew it would be a perfect “fall weather” food. It’s got cinnamon, apples, and honey, and I just knew that it would make the house smell delicious while it was cooking in the crock pot. Well, it definitely did make the house smell amazing….unfortunately, I can’t say it did a whole lot for our taste buds. I hate to admit it, but this did not at all meet my expectations. The recipe says to cook it on low for 7 hours. Knowing that in the past I’ve had meat get terrible dry after cooking that long, I only cooked mine for 5, and it was STILL completely tough and dried out. Is it just the cooking time? Does it need to be shortened even more? Is there any other explanation for my crockpot meats to come out so overcooked? Also, this doesn’t look all that appetizing when it comes out of the crockpot. 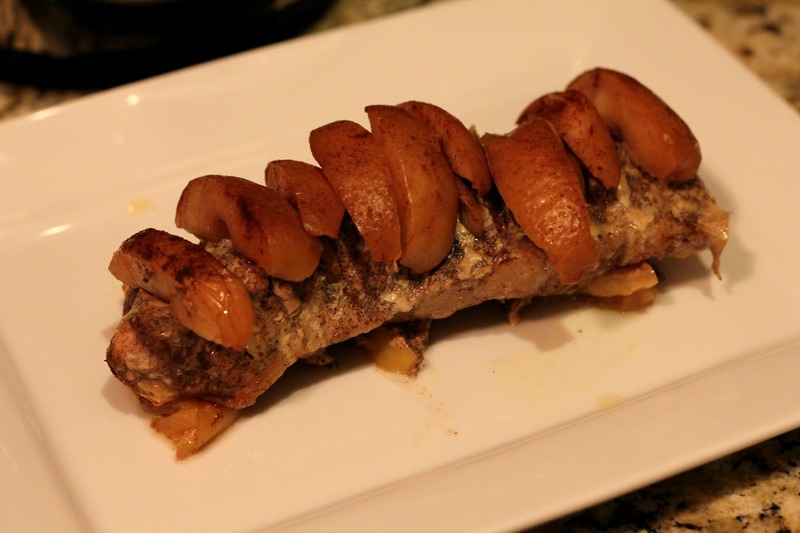 The meat turned gray (again, maybe because of it being way overdone) and the apples turned brown and mushy. The apples were kinda like a cinammon applesauce, but just not liquidy. With all that being said, here’s why I decided to post this recipe even though I’m not wild about it…First of all, maybe one of you can explain to me why any meat I cook in the crockpot comes out dry and overdone, even when cooked for hours less than recommended. Second, despite the dryness, this still had a good flavor. The cinnamon and honey really compliment the pork well. The night before you want to cook this, use a fork to poke holes in the pork, and then rub the pork with cinnamon. 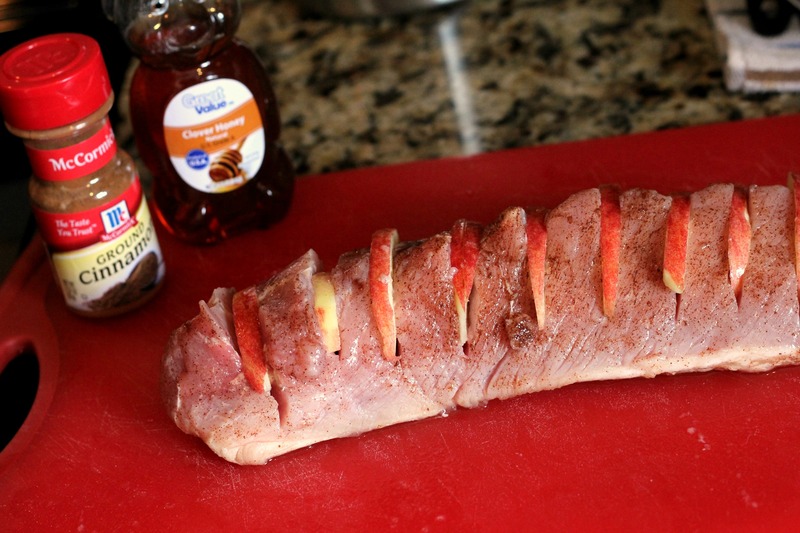 Put apple juice in a ziploc bag and then put the pork into marinade. Refrigerate overnight. Lay the apple slices (from two of the apples) in the bottom of the crockpot. Sprinkle with cinnamon. Cut slits in the pork loin (approx 1 inch). Drizzle some honey into the slits. Then place apple slices from 3rd apple into the slits. 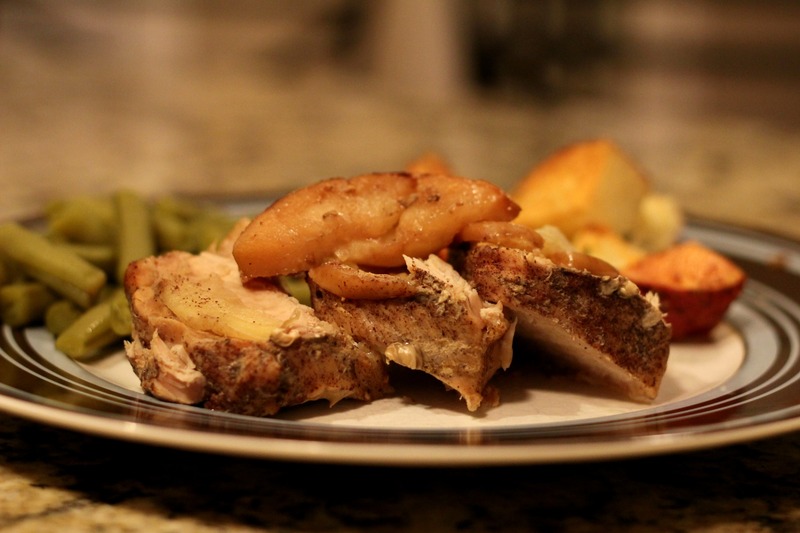 Place the pork loin into the crockpot. Drizzle the top with the remainder of the honey. Place the rest of the apples on top. Sprinkle with cinnamon. Cook on low for 5 hours or until done. Did you add any liquid to the crock pot or just put the meat in by itself? I always add a little broth to my pork tenderloin when I cook it in the crock pot and it always comes out super tender and juicy. Mine usually cooks for about 6 hours on the 6 hour setting. I actually did! I put apple juice in the crock pot in hopes that it would help it stay moist, but apparently to no avail. Hi! I actually created this recipe. I’m sorry it didn’t turn out for you. It seems like a trial and error recipe for many people, according to all the comments I’ve read. Most people love it, but there are some that it dries out for. It isn’t pretty after it’s cooked. I’ve cooked it many many times, and I did have one time that it dried out. I did everything the same each time. It must be the meat…. Try it again sometime and see how it works out for you! Hello! That is curious how it sometimes dries out and sometimes doesn’t The flavor really was delicious, and I know that if it had been nice and moist, we would have loved it! Hi – From looking at the pictures I think I know the difference. Looks the original recipe used a pork SIR loin and the other cook used a pork TENDER loin. Tenderloins can’t be cooked for very long and are much smaller than a sirloin (usally roasted at a high heat.) There is more marbling in a sirloin, as well. Just a thought! I had never thought of that, but it’s a great point! So glad you posted this bc I found a similar pin on Pinterest and thought it sounded great. Now I know to approach it with caution! It definitely had a good flavor, but just beware of how slow cookers can dry out the meat! If you do give it a try, let me know if it cooks correctly for you. The problem that I see is everyone keeps saying is that it is dried out. The reason for it being dried out is there is no fat left on the cut to return moisture to the meat. Whether you cook it in an oven or slow cooker, there needs to be a small portion of fat to meat ratio. The cut is ALL muscle. There is no connective tissue to release moisture into the meat. No matter how much liquid you add to it, there is nowhere for it to infuse the meat.